Influencer marketing continues to be one of the most effective ways for brands to authentically connect with their communities. And Instagram is leading the way. To better understand the power of Instagram influencer marketing we analyzed 2,113,307 Instagram sponsored posts worldwide – and found that Instagram influencer marketing grew by over 39% in 2018! In addition to the increase in volume, influencers are leveraging new tools to create more authentic and engaging content (hello Story!). We’re also seeing that women, micro-influencers and millennials continue to dominate the space posting the highest number of sponsored posts on Instagram. We compiled these Instagram influencer marketing statistics and trends in one report to help you create a more effective strategy in 2019. In 2018, Instagram reached one billion monthly active users and is showing no signs of slowing down. Characterized by its rich visual content, creative tools and high engaged communities, it continues to be a key marketing channel for brand-influencer collaborations. This is reflected in the number of Instagram sponsored posts on the network. In 2018, Instagram influencer marketing grew by over 39% with influencers posting over 2.1 million #ad feed posts worldwide. 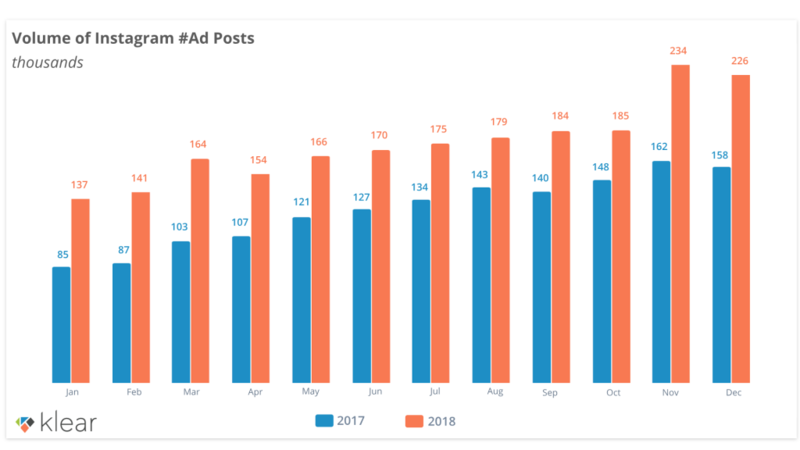 To calculate the data, we analyzed over 2 million Instagram sponsored posts that included #ad hashtags between Jan 1 – Dec 31, 2018. We then performed a statistical analysis of trends and demographics using our SIGIR award-winning influencer measurement technology. Since their launch in 2016, Instagram Stories have been gaining popularity (even surpassing their predecessor, Snap!). In 2018, 400 million people viewed Instagram Stories every day, and influencers adopted quickly. Our data shows that in 2018, 1 in 3 Instagram sponsored feed posts was an Instagram Story. So what’s the reason for the increase? 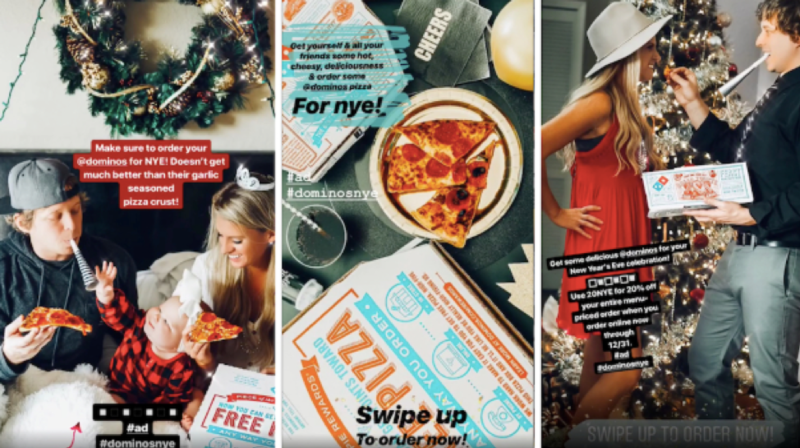 While we don’t know for sure, it’s clear that the raw, unedited nature of Instagram Stories offers a more authentic and engaging way for influencers to connect with their followers. With Stories, influencers can both share authentic content and promote the brands they value. Indeed, an Instagram survey showed that 39% or respondents became more interested in a brand/product after seeing it on Instagram Stories. Moreover, Stories offer influencers more tools for tracking and measurement. Influencers can now use the “swipe-up” feature to link to branded content (rather than relying solely on bio links). With smaller followings than celebrity influencers, micro-influencers offer quality over quantity – highly engaged, targeted communities rather than masses of “low-touch” followers. As a result, micro-influencers tend to be highly valued and trusted by their followers, making them equally valuable for brands. We estimated the number of micro-influencer sponsored posts by calculating the number of likes per post. The data shows that 84% of Instagram sponsored feed posts in 2018 received up to 1,000 Likes per post, demonstrating the level of influence. Want more of the latest influencer marketing statistics and trends? Download the full report to access 3 more key findings (hint: you’ll learn who’s leading the way in influencer marketing + which countries have the fastest IM adoption rates).